The study authors focused on the cataclysmic eruption of Indonesia's Mount Tambora in April 1815, which is thought to have triggered the so-called "year without a summer" in 1816. 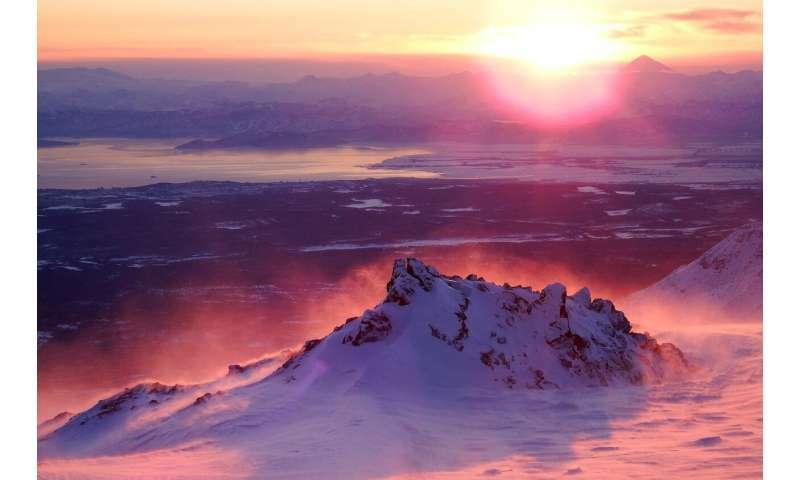 They found that if a similar eruption occurred in the year 2085, temperatures would plunge more deeply, although not enough to offset the future warming associated with climate change. The increased cooling after a future eruption would also disrupt the water cycle more severely, decreasing the amount of precipitation that falls globally. "We discovered that the oceans play a very large role in moderating, while also lengthening, the surface cooling induced by the 1815 eruption," said NCAR scientist John Fasullo, lead author of the new study. "The volcanic kick is just that—it's a cooling kick that lasts for a year or so. But the oceans change the timescale. They act to not only dampen the initial cooling but also to spread it out over several years." The research will be published Oct. 31 in the journal Nature Communications. The work was funded in part by the National Science Foundation, NCAR's sponsor. Other funders include NASA and the U.S. Department of Energy. The study co-authors are Robert Tomas, Samantha Stevenson, Bette Otto-Bliesner, and Esther Brady, all of NCAR, as well as Eugene Wahl, of the National Oceanic and Atmospheric Administration. To better understand and quantify the climate effects of Mount Tambora's eruption, and to explore how those effects might differ for a future eruption if climate change continues on its current trajectory, the research team turned to a sophisticated computer model developed by scientists from NCAR and the broader community. The scientists looked at two sets of simulations from the Community Earth System Model. The first was taken from the CESM Last Millennium Ensemble Project, which simulates Earth's climate from the year 850 through 2005, including volcanic eruptions in the historic record. The second set, which assumes that greenhouse gas emission continue unabated, was created by running CESM forward and repeating a hypothetical Mount Tambora eruption in 2085. The historical model simulations revealed that two countervailing processes helped regulate Earth's temperature after Tambora's eruption. As aerosols in the stratosphere began blocking some of the Sun's heat, this cooling was intensified by an increase in the amount of land covered by snow and ice, which reflected heat back to space. At the same time, the oceans served as an important counterbalance. As the surface of the oceans cooled, the colder water sank, allowing warmer water to rise and release more heat into the atmosphere. By the time the oceans themselves had cooled substantially, the aerosol layer had begun to dissipate, allowing more of the Sun's heat to again reach Earth's surface. At that point, the ocean took on the opposite role, keeping the atmosphere cooler, since the oceans take much longer to warm back up than land. "In our model runs, we found that Earth actually reached its minimum temperature the following year, when the aerosols were almost gone," Fasullo said. "It turns out the aerosols did not need to stick around for an entire year to still have a year without a summer in 1816, since by then the oceans had cooled substantially." When the scientists studied how the climate in 2085 would respond to a hypothetical eruption that mimicked Mount Tambora's, they found that Earth would experience a similar increase in land area covered by snow and ice. However, the ocean's ability to moderate the cooling would be diminished substantially in 2085. As a result, the magnitude of Earth's surface cooling could be as much as 40 percent greater in the future. The scientists caution, however, that the exact magnitude is difficult to quantify, since they had only a relatively small number of simulations of the future eruption. The reason for the change has to do with a more stratified ocean. As the climate warms, sea surface temperatures increase. The warmer water at the ocean's surface is then less able to mix with the colder, denser water below. Though the study found that Earth's response to a Tambora-like eruption would be more acute in the future than in the past, the scientists note that the average surface cooling caused by the 2085 eruption (about 1.1 degrees Celsius) would not be nearly enough to offset the warming caused by human-induced climate change (about 4.2 degrees Celsius by 2085). Study co-author Otto-Bliesner said, "The response of the climate system to the 1815 eruption of Indonesia's Mount Tambora gives us a perspective on potential surprises for the future, but with the twist that our climate system may respond much differently." Climate change? Wasn't that global warming a few minutes ago? This is as pointless a paper as the post by thomasct (sounds like one of those Russian Troll farm people to me.) Of course future eruptions will disrupt climate. Even a small one like Mt St Helens effected climate. Tax the volcanoes, it's the only option to curb this egregious behavior.